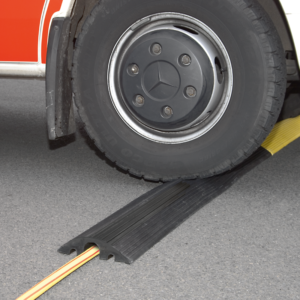 For temporary and permanent protection of cables, hoses and personnel. Cable bridges ensure maximum attention towards transverse wires, cables hoses to avoid tripping and slipping accidents. Furthermore, the cable bridges serve to protect the underlying cables and hoses from suppression and damage from e.g. forklifts . 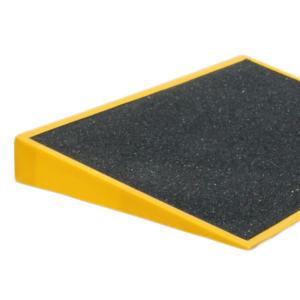 Real Safety cable bridges have a non-skid surface and they are made in hazard black/yellow colors for ultimate visibility. 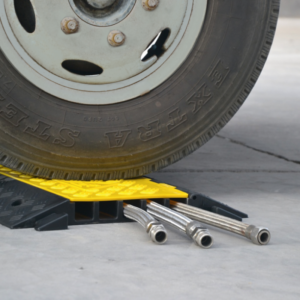 Ramps and cable bridges can be extended according to your needs. Available in different sizes. To hang up cables we also supply cable hooks in three different sizes: 8”, 10” and 12”. How to mount cable bridges and ramps? Find our installation and cleaning guide on the right side, under DATA. Please contact us for further information. You can call us at +45 26 11 44 66. If it's not wildly urgent, you are also very welcome to send us an email at realsap@realsap.com.